A series of blunders by the speaker of the Mpumalanga provincial legislature, Thandi Shongwe, spoiled what should have been a historic moment on the appointment of the province’s first female premier in 24 years. Shongwe’s spokesperson, Malusi Mbatha, blamed the Office of the Premier for the blunder. The premier’s office is believed to have facilitated the swearing in of Cogta MEC, Refilwe Mtsweni on Tuesday morning, which was facilitated by Judge President of the Mpumalanga division of the High Court, Francis Legodi on Tuesday morning during a ceremony held at the Nelspruit Magistrate Court. None of the parties involved in the fiasco were prepared to clarify the sequence of events, however, a statement issued by Mbatha indicates that Mpumalanga premier appointed Mtsweni as the Acting Premier, on the 26th February 2018, and minutes later, she received Mabuza’s resignation from the legislature. Whatever the sequence of events, Mtsweni was no longer the Acting premier of Mpumalanga province, as soon Mabuza resigned, however, Shongwe invited Mtsweni to occupy the seat of the Premier in the legislature and to participate in the debate of the State of the Province Address (SOPA). The debate happened on Tuesday 27 February 2018. Democratic Alliance’s Chief Whip, Jane Sithole objected to Shongwe’s decision, but Shongwe ignored the objection, even after she had read the Section 131 on the appointment of Acting Premiers. “She even read the section, but it was very clear to me that she didn’t even comprehend what she was reading. After reading the section in the constitution she said that I was objecting because I wanted to be the Speaker and that would never happened. I responded to her that my objection was based on the provisions of the constitution, but clearly she was lost and didn’t understand what was happening,” said Sithole. The DA chief whip said she was shocked that while Shongwe has been a speaker since 2014, she still didn’t understand the constitution of the republic of South Africa. The DA decided walked out of the sitting. “We decided to walk out because we didn’t want to be part of an illegitimate sitting and waste the tax-payers’ money. The Speaker was supposed to have taken a cue from what happened at the National Assembly. Speaker Baleka Mbethe delayed the sitting until a new president was elected to avoid a fruitless expenditure, but Shongwe allowed Mabuza to deliver the SOPA and to be debated in an illegitimate sitting,” said Sithole. The DA chief whip said she had requested copies of Mabuza’s letters of resignation and the letter appointing Mtsweni from Shongwe, but the latter has failed to provide such a letter. Sithole raised fears that Mabuza was still remotely controlling what was happening in Mpumalanga. “This is a clear indication that Mabuza continues to take decisions on behalf of the ANC in this province, even though he is no longer a premier,” she said. ANC chief whip, Johan Mkhatshwa admitted that the Democratic Alliance was correct to object to the debating of the SOPA. “I agree that they were correct, but that is a matter that we were already addressing, and the Acting premier will be sworn in before the SOPA debate. But the sitting on Tuesday was not only about debating the SOPA, it was also about adopting certain reports,” said Mkhatshwa. Meanwhile, Shongwe’s spokesperson, admitted that Mtsweni’s presence as the legislature on Tuesday was not as the Premier, but as the MEC for Cogta. “There was no premier at the sitting on Tuesday,” said Mbatha. If the sequence of events as presented by the statements from Shongwe’s office and the Office of the premier are to be believed, then Mtsweni’s stint as the acting premier must be the shortest, and it appears that it lasted seconds, and the possibility also exists that by the time she was sworn in, her appointment as Acting Premier had already expired. 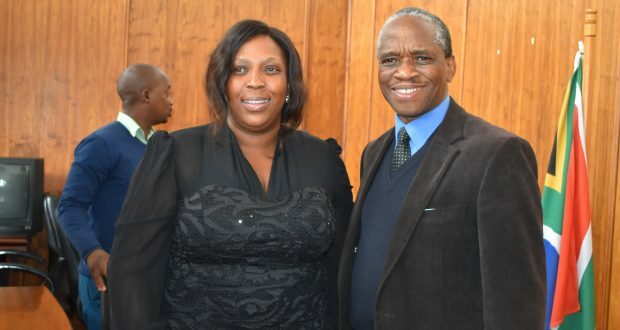 Mtsweni was sworn in as the premier by Judge President of the Mpumalanga division of the High Court, Francis Legodi on Tuesday morning during a ceremony held at the Nelspruit Magistrate Court. Seemingly, she was not aware herself that her stint may have expired. When asked why she was being sworn in to as the Acting premier, Mtsweni said the purpose was to ensure that there was no vacuum. “Nature does not allow a vacuum. 24 hours is way too much. Hence, whilst we are still waiting for processes to ensue, unfortunately government work has to go on. Hence this transition. I can confirm that the premier will be elected once all the processes have been finalised. As things stand now, work needs to continue,” she said. Mtsweni did not have a prepared speech, but obliged to speak and respond to questions posed by the journalists who had packed the small boardroom on the Fifth Floor of the magistrate court. She thanked the journalists who were present, whom she described as valuable stakeholders. “We welcome and appreciate your support as we execute our work as government of Mpumalanga. We hope that this is not the end of the journey, but the beginning of the journey. We are taking off from where our provincial premier left off,” she said. She congratulated Mabuza who had been sworn in as the deputy president of the Republic of South Africa the day before. Mabuza’s tenure both as premier and chairperson of the ANC was marked by controversies including allegations of corruption and elimination of his political opponents. Just days before he was sworn in as the deputy president, an Affidavit in which he is accused of being behind the political killings in the province emerged. The Affidavit signed by an alleged Mozambican assassin, referred to as Josh, was made public by erstwhile provincial secretary of the African National Congress Youth League, James Nkambule in 2010. The Affidavit is making damaging allegations against Mabuza, his former business partners and other soccer personalities. One of the alleged victims is Jimmy Mohlala, who was murdered at his house on the 4th January 2009. Mabuza has denied the allegations, but he surprised journalists in 2015 when he said he knew who was behind the killings, and that when the time was right he would expose the assassin or assassins. Premier’s spokesperson, Zibonele Mncwango confirmed on Wednesday that the Mpumalanga executive council met and appointed an Acting Premier who will be sworn in and serve for a period no longer than 30 days, wherein a new premier will be elected by the legislature. The executive council also appointed Mtsweni who was sworn in for the second time on Thursday, 1 March 2018 in Pretoria.